As the weather changes and winter finally dies away, Concord Mills and Northlake Mall are announcing some of their new stores slated to open this spring. At Northlake, be on the lookout for a new Aerie store on the mall's upper level, selling American Eagle's intimates and sleepwear sub-brands. An Orange Tree Frozen Yogurt, with self-serve frozen yogurt and a toppings bar, will further Charlotte's frozen yogurt boom when it opens in the food court, and a Verizon Wireless store is slated for the mall's lower level near Macy's. Concord Mills will add P.S. from Aeropostale, a children's casual clothing store targeting boys and girls ages 7 to 12. Robert Wayne Footwear is also slated to open soon, offering a selection of national brand shoes for men and women. And the mall said retailers Hot Topic, rue21 and Aeropostale are relocating within the mall and expanding their stores. Neither mall gave specific dates for the store openings. 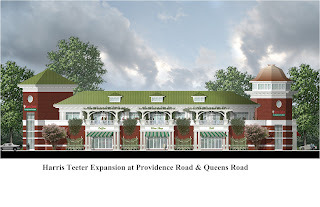 Harris Teeter announced today that it plans to expand the Harris Teeter Express at the corner of Providence and Queens into a two-story, 42,000 square feet store with a larger selection of groceries. "Harris Teeter's current store at 1015 Providence Road was built by its landlord over 60 years ago and is a very small store that limits the variety and selection the company offers at its other locations," the company said in a statement. The store was originally an A&P grocery store when it was constructed in 1938. Permits and zoning applications for the project have not been filed with the city of Charlotte. The grocery store would replace the existing buildings on the site, which include the current store and Myers Park Hardware, which is shut down. The new store building will be built back from the corner, towards the rear of the property near Huntley Place and Bolling Road, said Jeff Brown, a Charlotte attorney assisting Harris Teeter with the project. That move will create one larger parking area and a "much safer, more orderly," way for cars and trucks to enter and leave the property, Brown said. 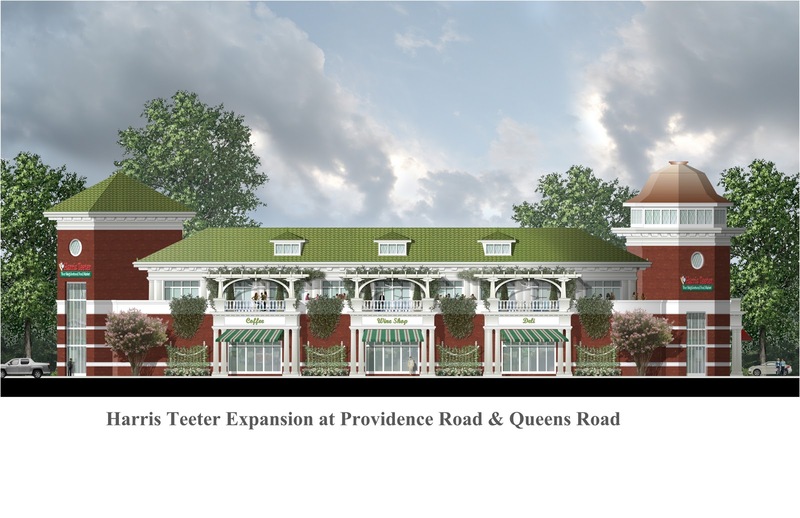 The ground floor of the new Harris Teeter is planned to be about 29,500 square feet, and a second story mezzanine level is planned to be about 12,500 square feet. The company said it will work with neighbors and respond to their input on the project. Uptown denizens will soon have a frozen yogurt option in OverStreet Mall, with the opening of The Frozen Isle. Adding to the ranks of stores such as Yoforia, Pinkberry and TCBY that have opened here in recent years, The Frozen Isle plans a soft opening (no pun intended) Saturday, Feb. 19 from 1 to 4 p.m. The weekend hours are a refreshing change for uptown residents accustomed to much of Overstreet Mall being shuttered outside of business hours. The Frozen Isle will be located next to Chick-Fil-A in the Bank of America Plaza in OverStreet Mall. Final hours haven't been posted yet, but a grand opening event is also planned next Tuesday, Feb. 22. The store will feature a revolving selection of 12 flavors of frozen yogurt, along with fresh toppings, dry toppings and sauces. As more and more businesses take advantage of an appetite for products that purport to be good for the environment, the number of green options keeps growing in Charlotte. More sustainable and organic foods are coming next year to a new SouthPark-area Whole Foods (near an EarthFare), the Ritz-Carlton hotel uptown will unveil electric car plug-in stations next week, and a new salon says you'll soon have environmentally-friendly options for your hair. Salon M2 claims in a press release to be the city's first "high tech, environmentally conscious "green" salon with a reduced carbon footprint." The salon, located at the Village at Robinson farm on Rea Road in the Ballantyne area, opens its doors Saturday, Feb. 19, with an 11 a.m. reception featuring discounts on products and services. Owners Michele Matkovich and Sarah Mitchell say the salon uses an overhead wiring system that extends the life of blow dryers, biodegradable, non-toxic, aloe-based hair products from Eufora and energy-saving technology such as a tankless water heater and high-efficiency heating and air-conditioning system. If you really love traditional metal-filament light bulbs, 2011 is the year to stock up on them, because you'll soon be hard-pressed to find them on store shelves. Mooresville-based home improvement giant Lowe's put out a press release commemorating incandescent light bulb inventor Thomas Edison's 164th birthday Friday - and reminding customers that federal energy efficiency legislation mandates a gradual phase-out of incandescent bulbs from 2012 to 2014. "While the phonograph has been replaced by sleek digital music devices, the telegraph by texting and the motion-picture camera by advanced, hi-definition and 3D technologies, we’re still using the incandescent light bulb today," Lowe's said in the release. Lowe's, like most retailers, is offering a greater selection of compact fluorescent lights (CFLs), halogen and LED light bulbs in advance of the new regulations. Although CFLs cost more upfront ($9.48 for a four-pack of 100-watt Sylvania CLFs vs. $4.48 for an eight-pack of 100-watt Sylvania incandescents at Lowe's), supporters say CFLs can save more than $40 over their lifetime by using three-quarters less energy and lasting ten times as long as incandescent bulbs. IKEA is the first major retailer to totally phase out incandescents, which they did in January. Retailers are working hard to sell customers on the energy efficiency and long-term savings of new light bulb options, presumably to help them deal with the sticker shock of vanished cheap lighting options. And evidence suggests they have a lot of work to do getting customers' attention. A telephone survey of about 1,000 adults commissioned by IKEA and released last month found that 61 percent are unaware that incandescents are about to burn out for good because of the new federal rules. With Americans forecast to spend $15.7 billion this Valentine's Day on things such as greeting cards, flowers, restaurant meals and lingerie, retailers are lining up to grab a piece of the action. Here's a very abbreviated list of specials, sales and even a few free deals going on around the day of love. Lowe's is offering a free workshop for kids this Saturday, February 12, showing kids how to build a heart-shaped music box from a kit to make a gift for the special someone in their life (most likely mom). Click here for more information. Belk's Valentine's sale is underway, with a $10 off $50 purchases, $20 off $100 and $30 off $150 to lure shoppers in, and lingerie and sleepwear marked down 30 percent. The Marble Slab ice cream store at StoneCrest shopping center will be giving away its new tiramisu ice cream for free on Valentine's Day. Lenny's Sub Shops in Charlotte are also giving away a coupon on Valentine's Day for a free sub to all of their Facebook fans. Do you know of any other free offers? Post them in the comments section. Independent We Stand, a national consortium of independent businesses, is encouraging consumers to shop local this Valentine's Day at store's like Dilworth's Paper Skyscrapers on East Boulevard. That store has handmade cards from five local artists for your loved ones. 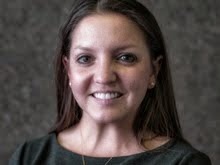 And if you really, really aren't having any luck meeting that special someone in person, don't worry: Paltalk, a video-chat website, is hosting a pre-Valentine's Day singles chat with Diana Falzone, a talk show personality and radio guru at 7 p.m. on Sunday, Feb. 13. Participants will be encouraged to ask Falzone questions and "perhaps even meet that special someone." "Turn to your neighbor and congratulate them for still being in business," the emcee told the crowd Wednesday night at a panel discussion for retailers at the Bechtler museum uptown. Retailers at the discussion, hosted by the International Council of Shopping Centers, echoed his theme: Glad to still be around, and hopeful for the coming year. They said they can see signs of recovery, in the Charlotte market and nationally. "We're going to have a solid increase," said Greg Wilson, vice president of real estate at Belk. "We've seen big increases in all stores around the Charlotte market, led by SouthPark, which is a good sign the luxury customer is back." Michael Udekwu, of apparel retailer Cato, said his store expects "flat to slow growth" but is continuing to open new stores around Charlotte. These include Cato, its Fashion Metro concept, and a new accessory-focused, smaller women's shop. But there are still plenty of mixed signals and reasons to be concerned. "I don't think we're through this economy," said Kent Gonnerman, real estate manager for Rack Room Shooes. "Hopefully, we'll see some stability in employment and more aggressive spending. We still see a lot of very calculating customers, focused on value, and if you don't deliver that, they won't buy from you." "The only buyers for land right now are speculators and bottom feeders," said Fitzhugh Stout, managing director of real estate firm Integra's Charlotte office. He said land is still being sold at deep discounts, and it could be four years before significant new retail space construction begins. "We were late entering the recession phase, and we'll be late entering the recovery phase," he said of the Charlotte market. Retail vacancy rates in the city's market were about 9.5 percent in last year's third quarter, compared to 6.7 percent the same time a year prior, he said. Still, the market has stabilized and some properties are appreciating again, Stout said. "Every indication we've seen is 2011 will be a better year than 2010." What do you think the coming year holds for retailers - a robust recovery or more shakiness? A walk-a-thon to raise awareness and money for childrens' congenital heart defects is scheduled for Saturday at SouthPark mall. The event, sponsored by Levine Cardiac Kids, will be at 9:30 a.m. in the mall's Center Court. A nonprofit, Levine Cardiac Kids' mission is to support children who are being treated for congenital heart defects and their families. Money raised will go to Camp LUCK, a medically supervised summer camp that offers kids with heart defects a week-long chance to be "regular kids." For more information and registration, visit www.levinecardiackids.com. Going-out-of-business sales are entering their final days at the two remaining Boyles Furniture & Rug stores in Pineville and High Point, barely a year after the stores' parent company announced it was exiting Chapter 11 bankruptcy with a plan to survive and pay off debts. Conover-based Hendricks Furniture Group filed for bankruptcy in 2009, citing the dismal housing market and decline in home furnishing purchases. At its height, the company operated 34 stores in the Carolinas, Georgia and Florida, many under names other than Boyles, and Hendricks had retail sales of more than $270 million a year, according to court filings. But after emerging from bankruptcy, the company was down to five Boyles stores in the Carolinas, which it said at the time were profitable. Since last year, three have closed, in Mocksville and Hickory. By October, court filings show Hendricks had repaid about $28 million to its creditors and $2 million in legal and accounting fees. In December, a judge officially closed the company's Chapter 11 bankruptcy case. On December 31, the company announced it was liquidating the last two Boyles stores, 61 years after Boyles opened. Commercials posted online Monday urge customers to get to the Boyles stores in Pineville and High Point for the "final days" of liquidation sales. No final date for the sales was given, and no one at Hendricks Furniture Group could be reached immediately on Wednesday. "We are now closed for business," announced a recorded message at the company's corporate offices.The message said that the remaining stores are open 10 a.m. to 6 p.m. Monday through Saturday and noon to 6 p.m. on Sunday, but didn't say how long the liquidation sale will last. Hours after Democrats announced Charlotte will host their 2012 convention, the first politically-themed promotion is already being rolled out at one of the city's swankiest hotels. The Ritz-Carlton uptown on East Trade Street announced Tuesday it will offer a package deal called "Red, White, Blue and Green," to celebrate the convention announcement. The $269 deal includes a tasting of red wine, white wine and blue cheese, free parking for a hybrid or electric vehicle (to add the green aspect) and "deluxe weekend accommodations for one night." Although the Red, White, Blue and Green package will be available Thursday through Sunday starting this week, guests won't be able to actually book it for the week of the convention in Sept. 2012. Reservations can be made at 800-241-3333 or at www.ritzcarlton.com, and more information is available here. And though this appears to be Charlotte's first convention-specific business promotion, the thousands of visitors and millions of dollars expected to be spent in the city are sure to touch every aspect of retail business in Charlotte. Have you seen any other convention-themed deals, or do you have any ideas for a good one?